For engineering, manufacturing and business leaders who want to grow revenue and drive down costs, SOS® identifies and weeds out the root causes of problems – not just the symptoms. We work with your teams to implement long-term solutions to your unique challenges, create delighted customers, and help you beat your competitors. 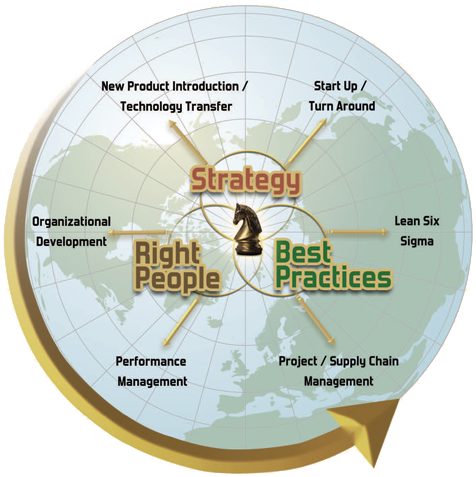 Strategic Operations Solutions® can help your manufacturing operations become a world class strategic weapon, supporting your business imperatives in product leadership, customer intimacy, and operational excellence! A focused vision and actionable strategic plan for your Company’s success. Deliver timely and profitable new product introductions and technology transfers. Pursue startup and/or turnaround initiatives as appropriate. Include sustainable strategies, from your supply chain to your end customers. Incorporate the relevant key metrics that promote world class performance. Benchmark and understand how your operations compare against your competitors. Utilize Lean Six Sigma techniques to eliminate waste and minimize process variation. Deploy project/supply chain management methodologies to improve customer satisfaction. Improve your operations continuously for the greatest strategic leverage. Delight your internal and external customers in on time delivery, quality, and cost. Leverage your employees’ intellectual capital and contributions for performance improvement. Develop high performance learning teams and address skills/behavioral gaps. Improve performance management via actionable plans and alignment of KPIs. Sustain cultural change via leadership coaching, mentoring, and counseling as appropriate. Add value to your Company’s strategies, focusing on existing and future customers. We implement proven solutions for projects from top line growth to bottom line performance, aligned with your strategic imperatives, from concept to commercialization. Contact SOS®. We deliver interim management solutions, enable cultural transformations and strategic initiatives, and facilitate leadership transitions seamlessly. Contact SOS®. We serve as your trusted advisor to help you set SMART goals and stay on track to reach specific professional and organizational development objectives. Contact SOS®. In need of a bilingual and multicultural professional with extensive domestic and international operations management experience, including startups and turnarounds, technology transfers and new product introductions, and supply chain development? Contact SOS®. Our best results have been achieved by integrating plans and communications with personnel from the shop floor and Manufacturing, Engineering, Marketing, Finance, Human Resources and Sales, and including Suppliers, Customers and Boardroom executives as appropriate. Hence, if your Company aspires to build a world class winning organization, where speed of implementation is required for rapid competitive advantage, then consider our value proposition, unparalleled expertise and track record, and contact us to explore what Strategic Operations Solutions® can do for you!